Learn how the Stock Trends analysis of the market can instruct your trading - and guide you to profits! Not interested or able to follow the markets on a daily basis? Use Stock Trends Weekly Reporter to make timely, trend-based trades that investors can hold for weeks or months. The weekly report service keeps subscribers informed about transactions in the very successful Stock Trends trading strategies. Every week you will be able to see what stocks were bought, and which were sold in active portfolios. Stock Trends Picks of the Week report and the Stock Trends statistical reports also give investors plenty of trend trading ideas and profitable trading signals. Other reports highlight stocks and ETFs that have changed trend, hit support or resistance levels, had unusual volume of trading, or rank performance among constituent stocks of various indexes. Stock Trends Weekly Reporter puts you on top of the weekly market action! Keep focused on stock market trends and be done with the buy-and-hold approach that has performed relatively poorly in the last decade. Stock Trends Weekly Reporter will help you take charge of your financial future! 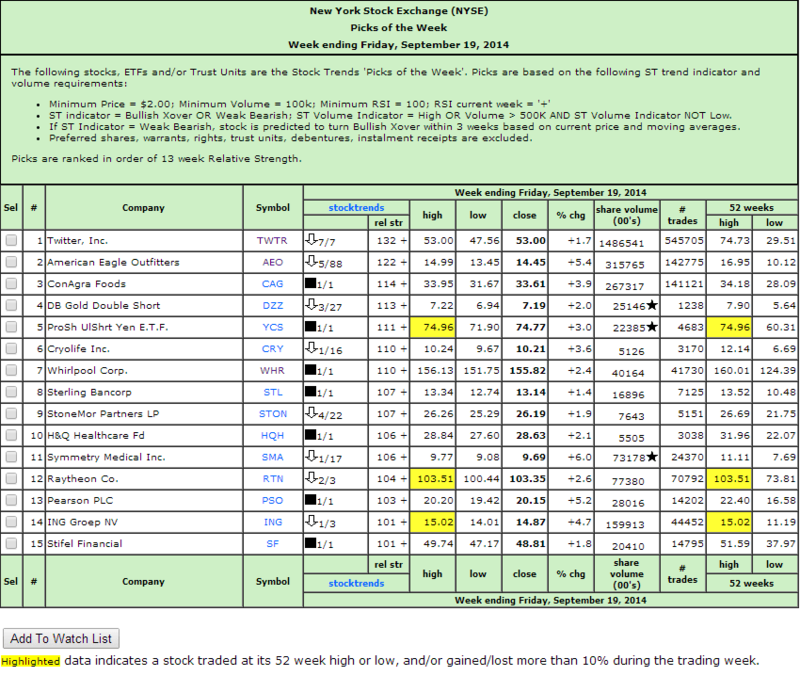 Weekly trend analysis of stocks and ETFs trading on NYSE, AMEX, NASDAQ and TSX exchanges. special filter reports on the North American stock market and trading strategy portfolio transactions. Editorials and articles about market trends and trading strategies. Access to extended content in Stock Trends Reports and weekly stock data history. 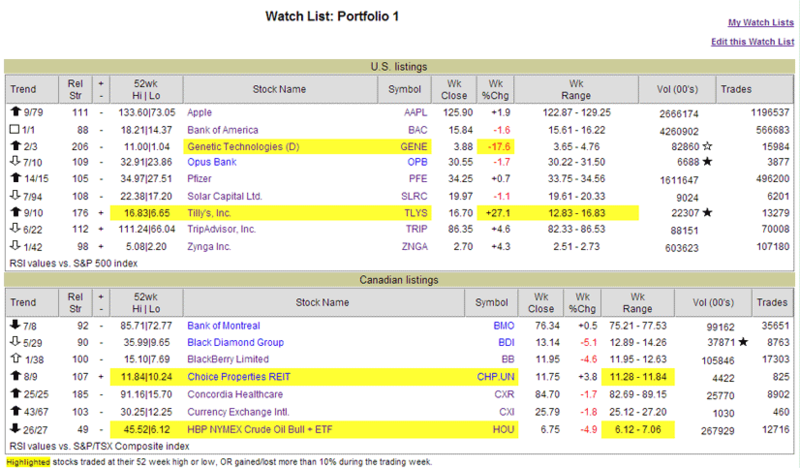 access to a Stock Trends Watch List feature, allowing users to create personalized stock reports. No-risk 30-day satisfaction guarantee - if not satisfied within 30 days, cancel and receive a full refund of your subscription fees! Click the "Learn More" button below to find out more about how Stock Trends will help you! Monthly subscription plan to Stock Trends Weekly Reporter - pay your monthly subscription fees by having them automatically charged to your credit card. Monthly subscribers may cancel at the end of any subscription month. 1 Year Prepaid subscription to Stock Trends Weekly Reporter. Save 16% off monthly rate! 2 Year Prepaid subscription to Stock Trends Weekly Reporter. Save 37% off monthly rate! 3 Year Prepaid subscription to Stock Trends Weekly Reporter. Save 44% off monthly rate! Close this window ..........but, please scroll down first! 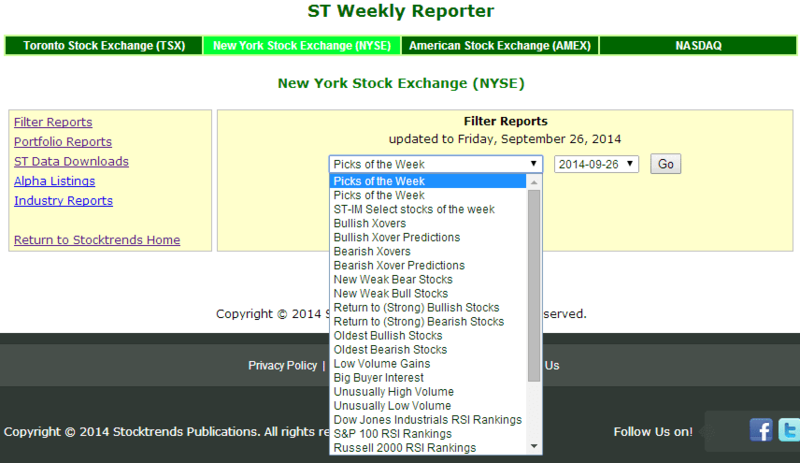 WHAT CAN STOCK TRENDS WEEKLY REPORTER DO FOR YOU? Overwhelmed by the market volatility? Sitting on the sidelines wondering what to do? Too busy to watch the markets daily? Get stock picks and trading strategies every weekend and learn how to trade trending stocks. Understand market trends, find trading profits ... and still have time to enjoy life! It doesn't have to be that difficult. After years of following markets and investing, diligently trying to understand how and why stocks move, it's time you put aside the questions of 'how' and 'why'. What IS important is that stock prices DO move, and that these prices tend to move in TRENDS. Trend analysis helps indentify WHEN to buy a stock, and WHEN to sell it. Stock Trends gives investors a method for succeeding in the market by keeping things simple. Our weekly presentation of stock data allows investors to step back from the volatile market and see the big picture. Remember: The market is always telling a story. Let Stock Trends tell it to you. Stock Trends WILL help you! weekly trend Profile reports on all stocks and ETFs, with forward return (%) expectations over 1wk/4wk/13wk/40wk periods. portfolio reports detailing weekly transactions and performance. trading signals for stocks that are breaking out or changing trend. trend and relative strength analysis on listed stocks and ETFs. alerts to high and low trading volume. relative strength rankings for select market index components. weekly historical price downloads - with up to 30 years of weekly data for some stocks. access to premium content areas. Stay on top of the market action - find winning trades! Succeeding in the stock market takes a lot of dedication. But it also helps if you have a mentor and tools that allow you to succeed. Stock Trends is designed to be your partner in your trading plan. It's designed to keep you focussed on the simplest, most understandable aspects of a very complex market. It's designed to make trading simple but methodical. Most importantly, it's transparent – the concept behind the analysis is easily understood – and it's supported by a convincing record of success. How are you managing in this difficult market? Stock Trends can help! Our Picks of the Week report has delivered many successful stock picks in the past year. Subscribers have access to weekly filter reports that help investors identify promising trade opportunities in the market. These filter reports have delivered many winning trades to susbcribers over the two decades Stock Trends Weekly Reporter has been published. No need to wade through vast amounts of information - Stay focused and profits will follow! Here's a sample of one of the many weekly reports that keep you focused on where the market opportunities are. The Stock Trends Picks of the Week report filters the weekly trading action and finds promising buy recommendations on the NYSE, Nasdaq, Amex, and TSX. Subscribers can create multiple Watch Lists to monitor their stocks. Keep track of your favourite stocks, and compare various portfolios. Part of being a successful investor is knowing when to sell. Our successful Stock Trends trading strategies will help you with portfolios you can follow. Currently there are 20 active Stock Trends Portfolios and every week subscribers get detailed transaction records highlighting buy and sell activities. These model portfolios show how automated trend trading strategies can be profitable! We'll be adding even more trading strategies in the future, but investors are bound to find the guidance they need to be successful. With the help of Stock Trends Weekly Reporter you can manage your own trading strategy! Technical analysis attempts to turn past patterns of price movements into a prognostication about future price movement. The Stock Trends Inference Model takes a quantitative look at the Stock Trends Reports and tells us something about how future returns have been distributed among stocks with similar trend and price momentum charateristics. Learn about how to turn these returns expecations into profitable trading. Make Stock Trends your go-to investment analysis resource every week! Stock Trends' unique approach to stock analysis gives investors a simple, but effective way to systematically trade the market. It's the kind of analysis that appeals to a systematic mind. It's your key to trading success! Put an end to overly complex ways of trying to out-smart the market. Subscribe to Stock Trends Weekly Reporter NOW!